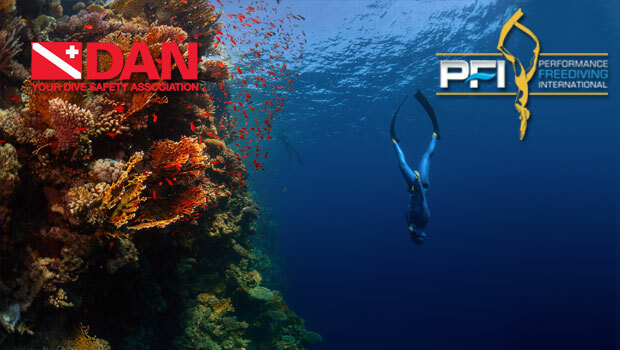 Through our alliance with DAN, we have helped them increase their knowledge and skills in freediving-related rescues, response times, and EMS care. DAN's Diving Emergency Management Provider program (DEMP) is now a requirement of all PFI Instructors and Instructor candidates. It is incorporated into the Instructor courses and includes CPR/BLS, First Aid, O2 Provider, and Administration/Instructor. It also includes Suction, Infancy Care, Wound Healing, Hazard Marine Life Injuries (HMLI), and Onsite Neurological Assessment Provider/Instructor. The integration of the course into our training standards expands our instructors' educational growth while the alliance serves DAN in better understanding safety and emergency procedures regarding freediving accidents and injuries. PFI's educational alliance with NAUI enables certified NAUI instructors to complete the PFI Instructor training program at an accelerated rate. Because they complete a portion of the PFI microteaching and skills during their own NAUI course director programs, their PFI Instructor training process is streamlined and efficient. PFI is happy to have strengthened NAUI’s network and educational goals. We are excited to continue to strengthen our alliance and help educate and certify many more instructors through the crossover program.